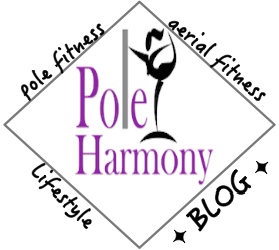 Pole Harmony: Yes you can! Every so often, when someone discovers I teach pole dancing for fitness, one of the first things that person says is, "I could never do that." I completely understand where they're coming from. Pole dancing can be intimidating. A lot of what has taken years to achieve is what is out there for all to see. The impressive tricks and flow is generally the representation of our sport. What people don't see firsthand is the hard work, struggles, and time that has gone in to getting to the point where one can levitate effortlessly and defy gravity. Everyone starts somewhere. And it usually isn't pretty. No way does someone just walk up to a pole and start moving- let alone flipping, effortlessly around the pole. Even if you have supernatural existing strength, you will still find struggles where you thought things would be easy. There are many aspects to pole that everyone should learn first and foremost for the safest technique to be performed each and every time. These foundational skills are the building blocks to bigger and better things in your pole fitness journey. We crawl before we walk. When we were little, we didn't just jump out of the crib and start walking. It was a process of building up muscles in our legs and increasing balance. The same process goes for learning pole- or any other type of dance discipline. You will first learn very easy moves that help you build strength in your legs and increase balance. Many of these moves consist of walking techniques and getting comfortable with apparatus dancing. Going back to the generalized statement I often hear in response to my teaching pole, "I could never do that." My answer to that is, if you can walk, then you can pole. Although, I'm beginning to think that times are changing and the matter of walking to do pole may no longer be a prerequisite as I'm almost certain if you're wheelchair bound, you can also find a way to pole. So if you've ever shot down the idea of pole, I strongly encourage you to rethink your stance. Pole dancing for fitness is fun, rewarding, and an activity that challenges areas of your body that typical gym workouts and equipment fails to engage. Pole dancing embodies all disciplines in fitness- from strength, cardio, flexibility, to balance. You can't get this much attention to all areas of focus from any other workout. If you're trying to decide if pole dancing for fitness is right for you, the only way you will ever know is by taking a class. To get started, check out your local pole dancing studio and sign up today for an intro to pole class. In a year, you'll wish you started today. Happy poling!